Hashemi, S., Asgarpanah, J., Alaee, Z., Sadeghian, S., Hasani, H., Azimi, A. (2014). In vitro antifungal activity of four medicinal plants used in Iranian Traditional Medicine. Research Journal of Pharmacognosy, 1(1), 39-43. S.J. Hashemi; J. Asgarpanah; Z. Alaee; S. Sadeghian; H. Hasani; A. Azimi. "In vitro antifungal activity of four medicinal plants used in Iranian Traditional Medicine". Research Journal of Pharmacognosy, 1, 1, 2014, 39-43. Hashemi, S., Asgarpanah, J., Alaee, Z., Sadeghian, S., Hasani, H., Azimi, A. (2014). 'In vitro antifungal activity of four medicinal plants used in Iranian Traditional Medicine', Research Journal of Pharmacognosy, 1(1), pp. 39-43. Hashemi, S., Asgarpanah, J., Alaee, Z., Sadeghian, S., Hasani, H., Azimi, A. In vitro antifungal activity of four medicinal plants used in Iranian Traditional Medicine. 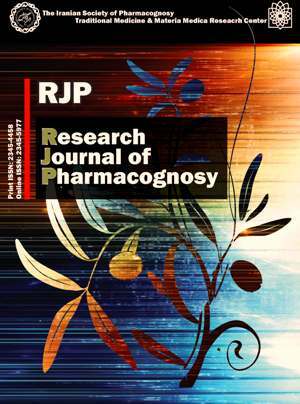 Research Journal of Pharmacognosy, 2014; 1(1): 39-43. 1Department of Medical Mycology and Parasitology, School of Public Health, Tehran University of Medical Sciences, Tehran, Iran. 2Department of Pharmacognosy, Pharmaceutical Sciences Branch, Islamic Azad University (IAU), Tehran, Iran. Evaluating the in vitro antifungal activity of Phlomis lanceolata, Rhynchocorys elephas, Otostegia persica and Eremurus persicus, four species used in Iranian Traditional Medicine, has been performed on the clinical isolates of the pathogenic fungi Aspergillus fumigatus, A. flavus, Trichophyton mentagrophytes, T. rubrum, T. verrucosum, Microsporum canis, M. gypseum and Epidermophyton floccosum and the yeast Candida albicans. The susceptibility tests were done by agar disc diffusion method and the minimum inhibitory concentration (MIC) and minimum fungicidal concentration (MFC) of active extracts and sub-fractions were measured using the method of National Committee for Clinical Laboratory Standards (NCCLS). Among the investigated species, P. lanceolata sub-fractions were found to have fungicidal activity. The MIC and MFC was found to be considerable in petroleum ether, chloroform and ethyl acetate fractions (100 and 200 mg/mL) against the studied fungi and the yeast Candida albicans. The species appears to be a promising remedy for fungal based diseases, yet further studies are necessary.